The airplane/treadmill problem is similar. It contains a basic ambiguity, and people resolve it one of a couple different ways. The tricky thing is, each group thinks the other is making a very simple physics mistake. So you get two groups each condescendingly explaining basic physics and math to the other. This is why, for example, the airplane/treadmill problem is a banned topic on the xkcd forums (along with argument about whether 0.999… = 1). Imagine a 747 is sitting on a conveyor belt, as wide and long as a runway. The conveyor belt is designed to exactly match the speed of the wheels, moving in the opposite direction. Can the plane take off? The practical answer is “yes”. A 747’s engines produce a quarter of a million pounds of thrust. 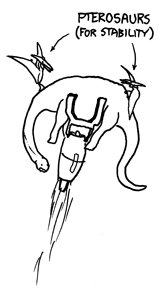 That is, each engine is powerful enough to launch a brachiosaurus straight up (see diagram). With that kind of force, no matter what’s happening to the treadmill and wheels, the plane is going to move forward and take off. But there’s a problem. Let’s take a look at the statement “The conveyor belt is designed to exactly match the speed of the wheels”. What does that mean? 1. vB=vC: The belt always moves at the same speed as the bottom of the wheel. This is always true if the wheels aren’t sliding, and could simply describe a treadmill with no motor. I haven’t seen many people subscribe to this interpretation. 2. vC=vW: That is, if the axle is moving forward (relative to the ground, not the treadmill) at 5 m/s, the treadmill moves backward at 5 m/s. This is physically plausible. All it means is that the wheels will spin twice as fast as normal, but that won’t stop the plane from taking off. People who subscribe to this interpretation tend to assume the people who disagree with them think airplanes are powered by their wheels. But if we push with the engines, what happens? The terms of the problem tell us that the plane cannot have a nonzero speed, but there’s no physical mechanism that would plausibly make this happen. The treadmill could spin the wheels, but the acceleration would destroy them before it stopped the plane. The problem is basically asking “what happens if you take a plane that can’t move and move it?” It might intrigue literary critics, but it’s a poor physics question. So, people who go with interpretation #3 notice immediately that the plane cannot move and keep trying to condescendingly explain to the #2 crowd that nothing they say changes the basic facts of the problem. The #2 crowd is busy explaining to the #3 crowd that planes aren’t driven by their wheels. Of course, this being the internet, there’s also a #4 crowd loudly arguing that even if the plane was able to move, it couldn’t have been what hit the Pentagon. All in all, it’s a lovely recipe for an internet argument, and it’s been had too many times. So let’s see if we can avoid that. I suggest posting stories about something that happened to you recently, and post nice things about other peoples’ stories. If you’re desperate to tell me that I’m wrong on the internet, don’t bother. I’ve snuck onto the plane into first class with the #5 crowd and we’re busy finding out how many cocktails they’ll serve while we’re waiting for the treadmill to start. God help us if, after the fourth round of drinks, someone brings up the two envelopes paradox. The plane eventually takes off. There are three components here, not two. The plane, the treadmill, and the air. The treadmill is tuned to keep the plane’s speed with respect to the ground at zero. But as the treadmill speeds up, which it’s forced to do as the plane’s engines keep propelling it faster and faster along the treadmill itself, drag between the treadmill and the air accelerates the air. Eventually the plane reaches takeoff speed with respect to the air and liftoff is achieved. At that point, the treadmill is no longer keeping the plane from moving forward with respect to the ground, and forward ground motion begins. If the portion of the treadmill in front of the plane is sufficiently long, the plane may be able to gain sufficient airspeed to stay aloft once it exits from the regime of the local area whose wind speed is controlled by the treadmill. But if the treadmill in front of the plane isn’t very long, then the plane, moving forward at say 200 mph WRT to the artificially sped-up air above the treadmill (but not nearly that fast WRT the ground), will reach the end of the treadmill and quickly encounter less and less headwind. In that case it will reach stall speed and nose into the ground. A viewer placed, say on a hill several miles away, directly to the side of the cockpit, will hear the plane engines ramping up. They will see the treadmill move faster and faster (we can color it like a rainbow to make it easy to gauge the speed). Then at some point, the plane will slowly lift off the ground, in what appears to the ground observer to be straight up motion. Then forward motion will slowly occur. To the ground observer it will look like the plane took off with zero forward speed, and that it’s drifting forward at 1 mph, 2 mph… But that’s only ground speed. The airspeed will be the normal takeoff speed for that airplane. because “wind from prop” – lift generated directly from accelerated air from props is relatively small compared to the lift generated from forward motion. It would help achieve takeoff faster, but by itself, it is nowhere near enough for a plane to take off. At best, you can lift the tail. I hate to disagree, Patrick. But while you’re right about the wind eventually becoming a major issue (1), it wouldn’t result in the airplane ‘taking off’. Unless we’re assuming a treadmill hundreds of feet wide and half a mile long, the wind simply isn’t going to be consistent enough for the plane to take off, at all. It wouldn’t ‘stall’, really, it would never get to that point. However, at some point or another, a threadmill spinning at the absurd speed required would indeed create a gust of wind be strong enough to lift the plane off the ground enough that the super-duper magical wheel friction that everyone is pretending can happen will be lost. Probably on only one wheel. Thus resulting in one side of the airplane being suddenly allowed to move forward, rotating the plane and resulting in it hurtling down the threadmill end over end. Not that free-spinning wheels can possibly general enough friction to keep the plane in place, but that’s what we’re apparently assuming! 1) Although as I point out, we’ve got 250,000 pounds of thrust disappearing into wheel axle friction, which would cause rather serious heating problems well before the wind could do anything at all. The plane will take off, and in the problem the treadmill is irrelevant. The planes body (including the wheels) accelerate forward relative to the ground (not the treadmill) due to the conservation of momentum. i really enjoyed to visit this site.it is a very nice site and i book mark ur site. This is a really good read for me. Must agree that you are one of the coolest blogger I ever saw. Thank you for this very interesting infographic ! I’m talking about Google Venice on my blog. I know it’s late, I just found this. Daniel H. is right, but I don’t think he adequately explains why. The question is basically “Can a plane accelerate if the wheels have 0 traction.” This happens all the time, since the wheels on an airplane have no traction while the airplane is in flight, and airplanes accelerate in flight all the time. Slightly more scientifically, the engines (whether it’s a prop or a jet doesn’t matter) use the air around the airplane to create thrust and lift; the runway serves no purpose except to reduce friction from grass and weeds and rocks and small mammals. For a similar real world example, look at sea planes. In fact, the water creates more drag on the pontoons than a runway or a treadmill at any speed could produce on the airplane, and yet sea planes can still take off. Airplane engines create thrust, either by creating forward lift using a prop, or by creating a Newtonian action-reaction by the combustion of a fuel. In either case, whatever the plane is resting on has no affect on the plane’s ability to move forward, except where it creates drag (friction) against the plane’s wheels. The forward thrust of the engines causes the plane to move forward. The movement of the (relatively) motionless air passing over the lifting surface of the wings creates lift. This works using Bernoulli’s principal. Again, whatever the plane is resting on has no affect on the plane’s ability to create lift. An airplane’s wheels are free-spinning, except in some very expensive airplanes that have motors built in to spin the wheels up prior to landing – this reduces wear on the tires. Except for during landing (or braking), these expensive wheels are still free-spinning. Now to answer the question about the treadmill. 1.1: The treadmill is free-moving. Friction between the wheels and the treadmill will cause them both to move forward in tandem as the plane’s engine pulls the plane forward. The plane would take off normally, except there would be no tire wear from rolling down a runway. If we assume that the treadmill runs on a frictionless track, the plane would actually take off faster, since friction between an ordinary plane’s wheels and the runway slows the plane’s acceleration. 1.2: Vb = Vc. As the plane’s engine pulls it forward, the treadmill starts moving forward (as in 1.1), which causes the plane’s wheels to turn forwards (by some phantasmic unnatural force, or just a motor linked to a speedometer attached to the treadmill). The forward motion of the wheels against the treadmill increases the plane’s rate of acceleration and the plane hopefully takes off, leaving the treadmill behind, before this feedback loop causes it to accelerate to Warp Factor 10. 2. Vc= Vw. The answer given is correct, the wheels will spin freely, twice as fast as the plane’s ground speed (Vb = 2*Vw), but the plane would take off the same as if it was on a normal runway. There would be a negligible amount of friction in the wheel’s bearings that might slow the plane’s acceleration slightly. 3. The equation doesn’t match the premise. 3.1: “What if we hook up a speedometer to the *wheel*, and make the treadmill spin backward as fast as the speedometer says the plane is going forward?” The speedometer is linked to the wheel, and not the plane’s air or ground speed indicators, and therefore it’s the same as 1.2: Vb = Vc. 3.2: Vc = Vb + Vw. In this scenario, as the plane’s engine generates thrust and pulls the plane forward, Vw > 0, the treadmill would start moving backward at Vw. In this first infinitesimally small moment, Vb is still 0. In the very next infinitesimally small moment, the treadmill motion forces the wheels to start turning and Vb = Vw = Vc. Once we move past the infinitesimal, the stated answer is correct that the treadmill would very quickly ramp up to infinite speed. Your wheels would burn off and, if the plane didn’t manage to get airborne before then, the whole plane would crash on an infinitely speedy treadmill. But, depending on how long it took that treadmill to increase in speed, it’s possible the airplane would be able to take off, since, as the wheels are free spinning, the motion of the treadmill has a negligible affect on the plane’s forward motion. Here’s something to think about: equal and opposite reaction. 747 engines pull in air from the front, which pulls the engine forward. The engines also push air out the back, which pushes the engine forward. These 2 forces, the pushing and pulling on the engine and the air cause the engine to move forward. The engine is anchored to the wing (where some of the landing gear is attached) which is affixed to the fuselage to which the other part of the landing gear is attached. The purpose of the landing gear is to separate the plane from the ground. A) The plane takes off as usual with the landing gear wheels spinning >=2x faster than usual due to the fact that the runway can move. Have a nice flight. I wonder what landing on a treadmill would be like? B) The plane accelerates forward. The wheels start to spin and the treadmill engages. The treadmill and wheels respond to each other by going faster and faster until the rotational speed of the wheels far exceeds what the landing gear is capable of. The landing gear would then break appart and the plane would turn into a fiery mess. Sorry group #5. Easy to assemble and really quiet. It compares well to those at the gym. So nice to be able to workout at your convenience. it’s the speed of the AIR moving over and under the wings that creates lift. Not the speed of the wheels or engines. If the BODY of the plane is motionless, zero LIFT is created. Otherwise, all airports would be verticle and you would launch planes like the space shuttle saving a ton of money and space. The runways are needed not only for landing, but to allow enough room to accelerate the BODY speed of the aircraft to generate lift from air moving PAST the deferentially curved surfaces of the wing. This is not that hard to solve.. If A. then the plane will not take off the ground/treadmill. As long as the total thrust capacity of the engines cannot lift the plane straight up. It does not matter that the plane can push forward .. it only takes off once air can push beneath the wings and since the only circulation of air that happens is inside the turbines then i’ts like having just a turbine on wheels that can generate no vertical lift run around a track.. straight line …whatever. .. plane takes off because of both engine and it’s wings. If B. then the planes wheels will explode and the plane will be thrown by the threadmill towards the back of the runway into a fiery death. Really a great Insight! Thanks for sharing. The conveyer belt is designed to exactly match the speed of the wheels at any given time, moving in the opposite direction of rotation. The conveyer has complete control system that tracks the plane’s speed and tunes accordingly. I can’t tell if the blog is giving a definitive answer, but as a pilot, to me the answer is obvious. Taking off and landing are very similar. Simply suppose the plane is not taking off, but landing. It has an airspeed, and when that airspeed crosses the speed needed for flying, it either takes off or lands. Now, suppose somebody on the internet is putting a treadmill on the runway, and trying to make it match the speed of the wheels. It can’t be done, because the airplane is moving. So the statement of the problem is not physically possible. I think this problem can be solved by a simple dependent/independent variable analysis. For non-slip wheels (this is why I disregarded v_b here), one has v_s = v_w + v_c, no matter which case one considers. In the case of motorized wheels like those of a car, v_w depends on the interplay of v_c and v_s [one would write v_w = f(v_c, v_s) ], that is if the wheels spin fast enough, the car will move forward, but if the belt matches the speed of the wheels, it will remain stationary. For free-spinning wheels like those of a plane, the dependent variable is no longer v_w because the plane is “pushing” against the air in order to move and the wheels follow (and not the the other way around). It is thus the spinning speed v_s that depends both on v_w and v_c, i.e. v_s = f(v_w, v_c). If one increases the speed of the belt by a certain amount, v_s will increase by that same quantity. Same goes for v_w. Moreover, it is not possible to increase v_c such that only a part of the increase affect v_s and the other affect v_w. It is reasonable to say that v_w and v_c are mutually independent. This is the key to the problem. Unlike motorized wheels, v_w here can really be anything, no matter what value is assigned for v_c. The only effect this has is to spin the wheels more or less fast, while still satisfying v_s = v_w + v_c. As soon as the engines are fired up, the body of the plane accelerates and the resulting increase of v_w adds to v_s. Any subsequent increase of v_c would also speed up the wheels by the same amount, with no feedback to v_w. So really, if one wants the belt to run at the same speed as the wheels at all times (v_s = v_c), it is only possible if the plane is not moving or attempting to move at all, but that’s not a physical law preventing the motion of the plane itself. In this respect, the interpretation #3 of the original question doesn’t make much sense because it is impossible to satisfy v_s = v_c if a net force is applied to the body of the plane. Like it was already pointed, this would result with both v_s and v_c going to infinity (and theres no such thing in the universe, it’s evil !). I think we have got to the point where the theoretical physicists should stop theorising and the experimental physicists should start experimenting. Didn’t mythbusters actually prove a plane would take off on a treadmill at some point? Amazing! Amazingly amazing. Even after xkcd poses the scenario with a fair load of snarky condescension, directing folks NOT TO ARGUE the point, everyone argues the point anyway! “Imagine” and “exactly” are two words in the question that don’t leave any room for argument, and result in no nonzero speed. (See, I just argued it too!) I like to think a computer would give a n/0 error. What is it about this one? On so many forums around the internet it gets turned on the spit until burnt black. NO ONE CAN RESIST. It went for hundreds of posts on the RC Groups forums. I inquired a black hole physicist who PhD’d under Kip Thorne, and he said the question makes no sense. I’ll take that answer. Did you guys miss the last paragraph or something? Lift is generated by air moving across the wing. Without wind moving across the wing, no lift would be generated and the plane will not take off. The speed the engine is rotating or the amount of thrust it makes is irrelevant. Thrust from the engines is used to push the plane through the air, which allows the plane to move relative to the air, so basically the reverse of wind passing over the wings, the wings cut through the air, generating “their own wind” so to say. The wings cutting through the air are what create lift force. The body needs to be moving for this to happen, unless your treadmill is in a wind tunnel that creates enough wind to match the force of the engine thrust. Why don’t we just ask Richard Branson if we can borrow some money and then try it? The only way to resolve this is to buy an airplane, and a really REALLY fast, strong treadmill and test it out. Then we will have conclusive evidence.